While women’s skin often gets more attention in the skincare aisle, men’s skin also needs some TLC. There’s no need to slather on a face mask or spend hundreds of dollars on fancy products— just a few extra steps during the day can help keep the youth in that handsome face. Men have oilier, thicker skin with larger pores in comparison with women. Wrinkles are often deeper on men, and frequently form on the forehead and around the eyes. One of the most obvious difference is the presence of facial hair. Men who shave often or even every day commonly experience sensitivity and irritation, which can result from dull blades or not using the right amount of shaving cream. Even though there are these slight differences between women and men’s skin, the same products can be used for either. The simplest, no-frills approach to men’s skincare comprises just two steps. The most important step in any skincare routine, regardless of gender, is washing your face. Use a skincare cleanser if you want to make sure you’re ridding your face of bacteria and sweat, but using water alone with sulfur is also good in a pinch. Men should wash their face twice per day, once in the morning and once before bed. Combining two products in one, sunscreen and moisturizer, streamlines the skincare routine. Use sun block such as ELTA 46 Clear or Neutrogena Clear Face for daily protection from the sun’s rays. 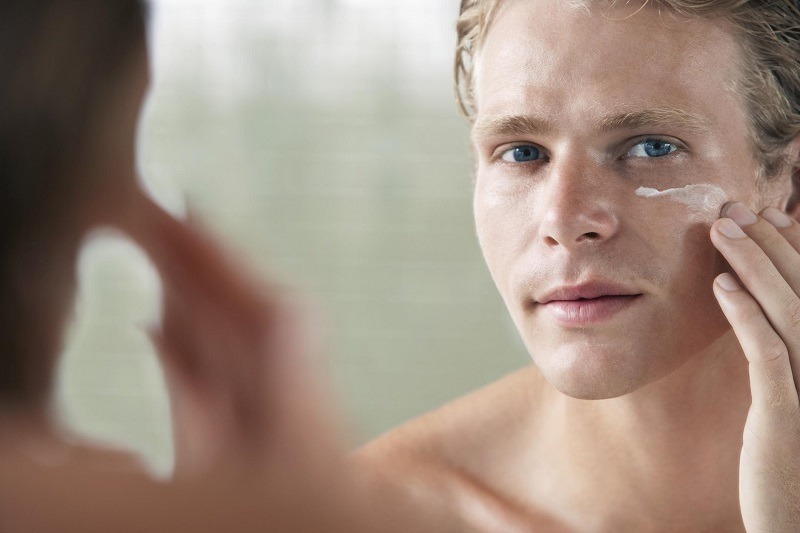 Because men have some other areas of concern — shaving irritation and a predisposition for wrinkles around the eye area — there are a couple additional steps they can take to keep their skin youthful and healthy. According to one study, men show more pronounced sagging in the lower eyelids than women as they age. To combat this, use a nightly eye cream, especially one that contains retinol. Low eye lid surgery can also help with sagging. With minimal downtime ResurFX™ can help improve the appearance of wrinkles on the face for deeper wrinkles that do not respond to topical treatments. Shaving can be incredibly damaging to men’s skin if done incorrectly. Make sure to shave on hot, moist skin — after a shower is always preferable — and use enough shaving cream and a sharp razor. Most importantly, take your time: rushing through a shave will only serve to irritate the skin even more.